You'll find many books to enjoy. Just take a peek! The hurricane is nature's most powerful force. Find out how, where and when these gigantic storms form and learn about the most destructive hurricanes. Adopted by the State of California. Recommended in Books for Young Readers, 1998, College of Education, University of Minnesota. Recommended as a resource in Weatherwise magazine, May/June 1998 issue. Recommended by Shenandoah Valley VA Youth Librarians. Discover how these huge, unpredictable, killer walls of water form, how they travel, and what happens when they near shore. Read the story-behind-this-story on the CLN website. Adopted by the State of California. Recommended in Books for Young Readers, 1998, College of Education, University of Minnesota. 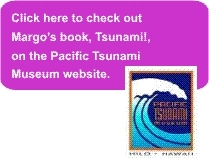 Endorsed by the Pacific Tsunami Warning Center and the International Tsunami Information Center. Copyright 2002-, Margo Sorenson. All information presented on these pages is the intellectual property of Margo Sorenson. Book excerpts are copyrighted by the publisher. Information and excerpts may not be used in any formwritten, verbal, or electronicallywithout the permission of Margo Sorenson or her publishers. If you would like to quote any portion of the website, please contact the author or the publisher by using links provided on this site to request permission.